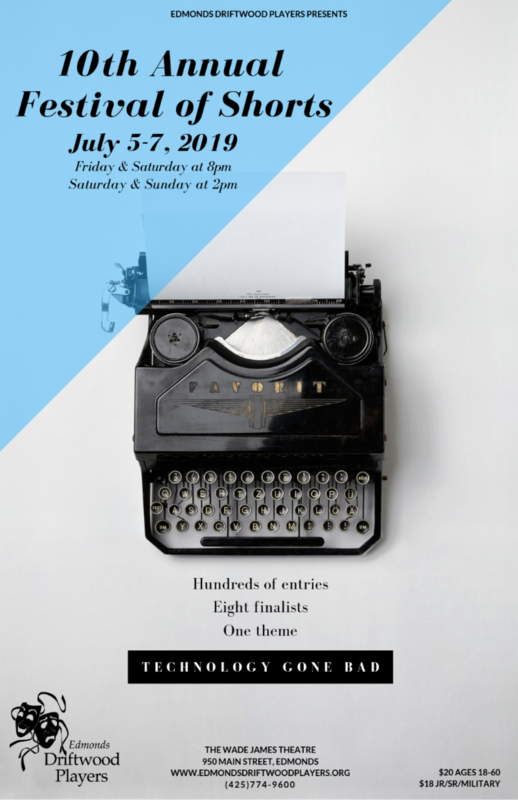 Submissions are now being accepted for the 10th Annual Festival of Shorts hosted at the Wade James Theater by Edmonds Driftwood Players. The Festival this year will be presented in four performances – Friday and Saturday, July 5 and 6 at 8pm; Saturday and Sunday, July 6 and 7 at 2pm. Theme for 2019 is “Technology Gone Bad.” With each major shift in technological advance in society, beginning with the wheel, there have been problems and reactions… sometimes with hilarious, sometimes disastrous, consequences. In an effort to help offset the costs of producing our growing Festival of Shorts, this year we will be charging a $5 submission fee for each playwright (not per submission).